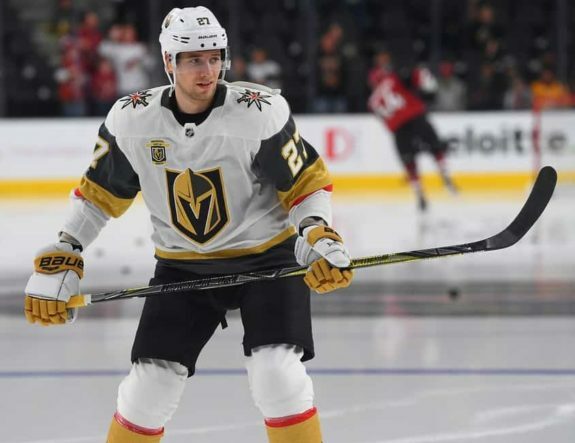 News broke in the early hours of Tuesday morning that young defenceman and restricted free agent (RFA) Shea Theodore committed to a long-term deal with the Vegas Golden Knights. The deal carries an annual average value (AAV) of $5.2 million over the seven years with no fluctuation, according to Pierre LeBrun. On top of that, the deal has no signing bonus and carries a five-team no-trade clause in the final two years of the contract. The 23-year-old is entering his fourth season in the NHL with 2017-18 being his best season thus far. Over his first two seasons in the league with the Anaheim Ducks, Theodore had a combined five goals and 17 points in just 53 regular season games. He was traded to the Golden Knights in June 2017 as part of their Expansion Draft considerations and gained a regular role on the team’s blue line during their inaugural season. There, with the opportunity, he recorded career-highs in games played (61), goals (6), assists (23) and points (29) in just over 20 minutes per game. He had a respectable 52.5 Corsi-for Percentage (CF%) and 52.2 Fenwick-for Percentage (FF%) in 2017-18 to bring his career numbers in both of those metrics right up around the 50 percent mark. On top of that, he played 20 games with the Golden Knights on their run to the Stanley Cup Final – doubling his playoff experience in just one season and adding 10 points to his postseason totals. At 23, Theodore is the youngest defenceman within that cap hit range. But how exactly does he compare to the others? 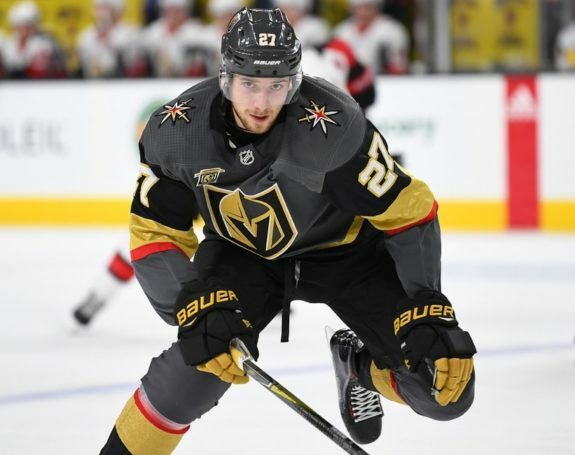 In comparison to some of these other defenceman, Theodore is a much less experience player who may be benefitting from the fact that the salary cap has increased over the last few years and that the Golden Knights will need his services with Nate Schmidt suspended for the first 20 games of the season. Already relied on for 20-plus minutes last season, the young blue liner will be looked to to eat up even more ice-time with Schmidt out of the lineup. That said, Theodore has yet to play a full season in the NHL. While he still only comes with a small sample size, Theodore has shown some impressive skill over his short career. But this contract doesn’t come without its own risks. Can Theodore remain in the lineup and stay healthy? Can he live up to the big contract in just his fourth season in the NHL? Time will certainly tell, but his new contract won’t come without expectations. After all, he’s the highest paid defenceman on the Golden Knights now and fourth on the team behind Paul Stastny, William Karlsson and the injured David Clarkson for the coming season. When the puck drops on the new season, eyes will be on the young blueliner as he attempts to impress following his holdout this training camp. And while he seems excited to be a part of the Golden Knights for another seven years, Theodore’s contract could hurt the team if he doesn’t play up to expectations. With Theodore signing, that leaves just two RFAs yet to put pen to paper – the Maple Leafs’ William Nylander and the Ducks’ Nick Ritchie.